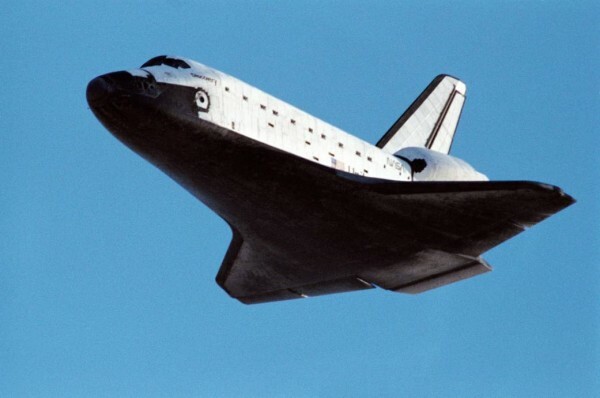 On April 29, 1990, the Space Shuttle Discovery approaches for landing on a concrete runway at Edwards Air Force Base to complete a highly successful five-day mission during which the Hubble Space Telescope was released into orbit. Discovery’s wheels came to a complete stop at 6:51:00 a.m. PDT. The landing gear was deployed just moments after this frame was exposed. Inside the spacecraft for STS-31 were astronauts Loren J. Shriver, Charles F. Bolden (now NASA Administrator), Bruce McCandless II, Kathryn D. Sullivan (now NOAA Administrator) and Steven A. Hawley.